After a long-term decline and relative stability in staple food prices since the 1973 oil crisis, two large spikes in 2007-08 and 2010-11 seasons have shaken the world troubling food security in developing countries and affecting related-commodity markets. Many reasons have been offered to explain the causes of these spikes, and because of the complexity of the topic and the interference by the factors affecting commodity prices there is not a clear and generally accepted explanation. Besides the spikes, there is a concern about if price volatility might be increasing and which factors could be behind this increase, because of the huge consequences of that volatility in a globalized world. In order to better understand the causes in this paper we review three recent publications focused on food price spikes using two different approaches: a literature review method to describe and assess the likelihood of the different causes attributed to the spikes; and an econometric approach using a structural vector autoregression (SVAR) model. As a main conclusion I think that both approaches are necessary and they are not exclusive because a good and correctly specified econometric model has to be based on strong literature review, and a literature review based method has to review econometric studies to find evidence of their hypotheses. Agricultural commodities, as every other commodity, are subject to the sometimes whimsical market rules. But differently than many other commodities, agricultural commodity markets are inherently volatile because of their strong links with natural shocks (Joachim von Braun and Getaw Tadesse, 2012). The increased trade of agricultural commodities since the industrial revolution of the eighteenth century has linked the world markets and globalized not only the benefits, but also the sensitivity to external shocks. Demand has been exponentially increasing mainly because of population increase in the 20th century, while food supply increased due to the growth both in acreage and yields obtained because of technical change. Although demand is increasing with a steady rate every year, world supply might have sharp changes reflecting extreme weather conditions suffered in producers’ regions. A very important issue about agricultural markets is that the products traded are essential for human life, therefore there is (or it should be) a special consideration of these products by the respective governments and protectionism is a key feature affecting this market. Food prices in real terms for bulk commodities have been steadily decreasing since the second half of the 20th century, although they have had some previous variations with the notorious example of 1973 spike associated with the oil crisis. The declining long-term trend in food prices shown above might be explained because the marginal cost of increased food supply has been lower than the increase in marginal demand. Even that population has increased so much, there is much more available food (obtained by technological change or new land cultivated) to feed that population. But this long-term declining trend in the second half of the 20th century has shifted in the beginning of the 21st century. As we can see in Figure 1 the real food price has grown in the first decade of the 21st century, with two very steep spikes in 2008 and 2011. Figure 1: FAO food price index in nominal and real terms. As a consequence of that and because of the high sensitivity of poor people to staple food prices (because their higher budget share spent on food, and their higher share of food budget spent on staple food) political instability has arisen in many countries. 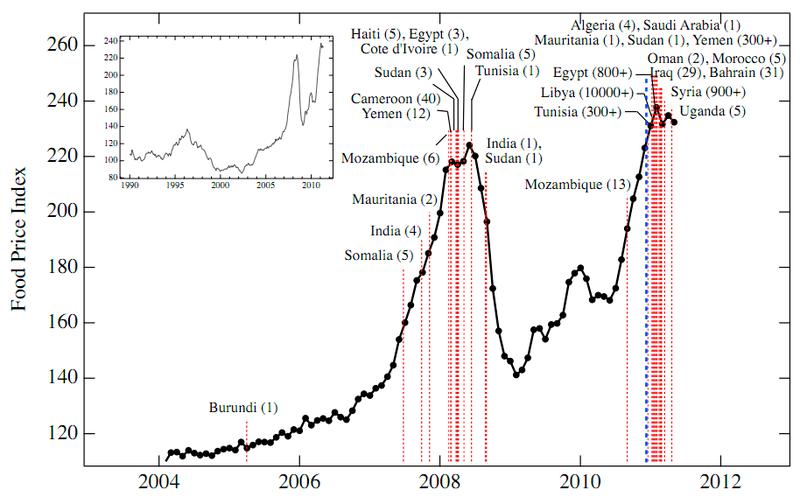 Figure 2 shows the number of riots occurred in several countries directly related with increased staple food prices, and we can see how price spikes in 2008 and 2011 triggered the proliferation of these riots. Demand side: increased per capita income in several developing countries (mainly China and India) is increasing demand not only for staple foods, but also for meat, that uses much more resources than staple food. Besides that, the new policies encouraging use of biofuels has brought a new competing demand of agricultural products, and also for the competing resources (land, water and other inputs) needed to grow food. Supply side: marginal costs for food supply have been decreasing historically because of new arable land and technical improvement to obtain higher yields. But most of the best land is now used, and the rates of yield increase have decreased in the last decades, therefore is very likely that the marginal cost to obtain new food supply has increased last years. Besides the new characteristics of the supply, there is always a concern about the sensitivity of agricultural supply to weather shocks, and even in a globalized world with much agricultural trade, major producers’ shocks can affect sharply the world supply of some commodities. Relation with economic activity: there are many relations of the “apparently exogenous” economic activity with the agricultural markets. On the demand side higher growth rates yields a higher demand from consumers, and on the supply side higher cost of production because increased prices in a more competitive economy (energy and fertilizers are related directly with oil prices, and also labor is more expensive). Besides the direct effects, there are other indirect effects as lower interest rates in an exporter country makes marginal storage costs more inexpensive and might also depreciate the exchange rate encouraging exportation, increasing prices of local products. Speculative demand: demand that is not used for direct consumption, but rather to obtain benefits from current lower prices to sell afterwards at a higher price. There are two types of speculative: a traditional one motivated by the storage economic model; and a second one that has grown lately driven by the financial markets. Precautionary demand: as some of the staple food (mainly grains) is storable, competitive storage models ( D. Wright and J. C. Williams, 1982) states that firms will hold inventories of storable commodities such that the current price equals the discounted value of the expected price in the future. Low prices induce storability, whereas higher prices can result in empty inventories. Financial speculation: portfolio diversification of investments has turn the eyes of the commodity index trader to food futures markets. The recent financialization of commodity futures markets and the presence of commodity index traders has been associated with these alternative food market speculation (Joseph P. Janzen et al., 2014). Increased volatility because low inventories: the competitive storage model mentioned above predicts that high inventories can provide a buffer against supply and demand shocks, whereas when inventories are low market is vulnerable and prices will respond directly to the shocks without protection. Policy responses: in a situation of a volatile world commodity prices most countries try to protect themselves by enhancing barriers to trade, reducing the flexibility of the market and producing most of the times an even worse scenario. In this section we try to summarize the different approaches that we have reviewed to analyze the causes of the food price spikes. The first is a literature-review-based approach, whereas the second approach obtains results developing an econometric model using a panel data from different sources that tries to capture the variation of the prices of wheat from an expected trend. We have analyzed two recent publications using this approach to assess the causes of the food price spikes. In the first one C. A. Carter et al. (2011) do an exhaustive review of the agricultural economics literature comparing the price spikes of 2007-08 and 1973-74, obtaining that there are many similarities (concurrence of energy and other commodities’ rise in prices) but also some differences (in 1973 peak agricultural commodities led the spike, whereas in 2008 prices moved concurrently). To strength their hypotheses they develop a two-stage model to understand actors’ behavior in a boom-bust cycle including producers, consumers, processors and speculators. Based on this theoretical model, but without using any empirical test, they conclude that 1973-74 and 2007-08 spikes shifts in supply and demand were the major contributors of the spikes (73-74 because of inward shift in supply that resulted in a crude oil price spike and all refinery energy products related with the OPEC embargo on the United States concurrently with El Niño weather shock reducing available supply and several policy failures elsewhere, whereas in the 2007-08 spike was caused mainly because of shifts in demand because increased income of developing countries and appearance of biofuels as a competing demand, concomitantly with precedent multiyear Australian drought and reduction in metals supply because of the closing of South African underground mines). Following the same model they state that speculative demand, even though it could have a small effect on the spikes, is mostly beneficial because forward contracting reduces the risk faced by producers encouraging production and mitigating boom-bust cycles. After the development and explanation of their two-stage model, reviewing the literature about competitive rational storage model (R. L. Gustafson, 1958, J. B. Williams, 1936, B. D. Wright and J. C. Williams, 1982) they provide evidence that inventories decreased sharply with increased prices in the beginning of both spikes and when the inventories were almost empty the agricultural markets were unprotected against new increases in prices. The next section offers a macroeconomic explanation about commodity price in these price spikes: movements in interest rates have large effects in production processes for many of the capital intensive commodities at the same time that storable commodities are very sensitive to interest rates; whereas exchange rates play a high role in demand shifts because international agricultural trade. In both of the spikes, it was a previous inflationary period that the governments try to interrupt by reducing interest rates, what caused a depreciation in the currency of principal exporting countries (US and EU) and that caused a upward shift in world importing demand. A. Carter, G. C. Rausser and A. Smith (2011) present later other cause affecting price spikes that is the cross-commodity linkages. In this point they relate the increasing costs of production with the energy prices, and after they state again the increased competition in demands because the appearance of biofuels. The main conclusion is that historical prices of grains have been related with petroleum, but with the current relation of agricultural commodities with fossil-based fuels this link is closely tied. Finally both boom-and-bust cycles have some policy responses that worsen the situation. To face a volatile world commodity market, many countries tried to protect themselves by enhancing trading restriction. There are many examples in 1973-74 and 2007-08 and in both cases the authors present evidences that most of these policies were costly not only for the world as a whole, but also for the countries that enacted these restrictions (for example the US soybean export embargo in 1973 or the increase in soybean export taxes in Argentina in 2007-08). To conclude C. A. Carter, G. C. Rausser and A. Smith (2011) state that both boom-and-bust cycles were very similar and the main causes were the supply and demand shocks, low inventories, a period of strong economic growth in lower-middle-income concurrently with low interest rates in rich countries, cross commodity linkages that increased costs of production and increase demand because of biofuel production, and a bad policy response that exacerbate rather than mitigate the situation. They find very little support to the speculative arguments in the literature reviewed. In the second paper reviewed J. P. Chavas et al. (2012) presented in an introductory chapter nine papers that relate directly with the economics of price volatility: first they document the recent and historical patterns of price volatility because demand and supply conditions including technological change and analyzing elasticity of aggregate supply and demand; second section studies how food price volatility relates to linkages between food markets and energy markets looking for the effects recent biofuel policies and its implications, and in a macro scale how market linkages across sectors (agricultural, energy and others) are important; third section assess the impact of storage and speculation by presenting the role of storage as a means of reducing price volatility and how “financialization” of commodity market is affecting prices concluding that these did not cause massive bubbles in future prices; fourth section explores the role of international markets analyzing the relationship between stabilization policies in developing countries; and finally two studies analyze the welfare implications of price crisis, and the effects of trade insulation against price volatility urging for caution against policy positions that would condemn trade insulation practices. The second approach that we reviewed is an econometric model of the wheat price spikes in the United States presented by Joseph P. Janzen, Colin A. Carter, Aaron d. Simth and Michael K. Ajemian (2014). In this paper three different futures market prices of wheat (hard red winter, Kansas City; hard red spring, Minneapolis: and soft red winter, Chicago) are analyzed. The authors develop a model to understand how the prices in each of the futures market deviates from an expected trend, and they attribute that deviation to four factors that they identify: global real economic activity and commodity demand; wheat-specific supply-and-demand factors; speculative or precautionary demand; and financial speculation, Commodity Index Trading and Comovement. These four factors are taken after a review of the literature and the authors attribute all the deviation from the expected prices to these factors. In order to do that they pose a structural vector autoregression (SVAR) model that analyzes the residual variation from the expected trend of an initial simple system of linear equations to represent the observed variable included in the model as a function of past variables in the system plus some unanticipated variation. They use exogenous variables as ocean freight rates (as an index of real economic activity), price of oil (as an proxy for speculation-induced comovement) and the difference between deferred futures contract price and the nearby futures prices based on the working curve relationship (as a proxy for stockholding). Finally the rest of the variation is attributed to net supply shocks. Using panel data from the early 90s to 2011 they obtain a really insightful impulse-response functions (how isolated factors affect over time the main variables) and the historical decomposition of the factors affecting price variation. They also do a counterfactual analysis looking of how prices did move if one of the factors was not affecting over time. The main findings are that most of the variation comes from the net-supply shocks, a small effect from precautionary demand and real economy activity, and finally that commodity index traders had a very little effect on the price variation. The literature-review-based approaches presented summarize the causes offered by the scientific community to explain the commodity price spikes. C. A. Carter, G. C. Rausser and A. Smith (2011) did a stronger work than J. P. Chavas, D. Hummels and B. D. Wright (2012) presenting much more evidence based analysis because the second paper was only an introductory chapter in a larger book. The strength of this approach is that they have a lot of flexibility to present all the causes that they think that affected price volatility and in this sense they did a very good job reviewing the literature of boom-and-bust economics and comparing and finding evidence of the great similarities of 1973-74 and 2007-08 cycles, and they do not have to look for data to develop and support a concrete model. The weaknesses of the literature-review-based approach is that they are looking for many isolated effects studies that probably are underestimating the linkages between the causes and consequences, and because of that they are probably attributing to some causes the effects that are produced from other causes. Other problem that I see in this approach is that it might be some overlapping between causes-effects attribution: for example they are presenting twice the same evidence about the effects of increased costs of production for agricultural products, first when they offer the macroeconomics explanation and after when they are presenting the linkages between markets. From my point of view other weakness from the C. A. Carter, G. C. Rausser and A. Smith (2011) is that they present and develop this two-stage model including producers, consumers, processors and speculators and they obtain some insights from there but without present any empirical-based evidence of the use of this model. They should explain better how this model is used. I think that the main advantage from the econometric approach presented by Joseph P. Janzen, Colin A. Carter, Aaron d. Simth and Michael K. Ajemian (2014) is that they are using real data and trying to explain a real case. They used the literature-review-based approach to identify the causes and then they presented a model to explain how the effects are related with the causes that they identified, exposing their approach not to a speculative formulation, but rather to a real situation. Even though that the approach is really interesting I think that there are many weaknesses in the methods and data that they use to explain the complete situation created in the 2007-08 food price spike. First they are looking only for the wheat market, forgetting the linkages with other substitute markets (other grains or food) that are directly related with wheat futures market prices. Second I think that they are miss-specifying the model only including these four factors, and even worse they are attributing to the net-supply shocks all the leftover from the other three factors, probably overestimating the net-supply effect (and probably they could uses some proxy to net supply using estimated production from acreage and weather conditions). Third, they are not using long-term demand shifts, even when they recognize that this demand has been shifting upwards because demand increase by low and middle income countries. Even though, if a correctly specified econometric model is developed including all the variables that are affecting price volatility and using real data I think that the results that we would obtain from a case study would be closer to the reality than those results that are just inferring the results from other studies as the literature-review-based approach is doing. This is not the case in the comparison that we have done because the econometric approach that we reviewed has many weaknesses, mostly that it is partial because only include wheat and probably miss-specified, and probably the results of the literature-based-approach is providing more insights about the causes of the food price spikes analyzed. Carter, C. A.; G. C. Rausser and A. Smith. 2011. “Commodity Booms and Busts.” Annual Review of Resource Economics, Vol 3, 3, 87-118. Chavas, J. P.; D. Hummels and B. D. Wright. 2012. “The Economics of Food Price Volatility. University of Chicago Press. National Bureau of Economic Research.”. Gustafson, R. L. 1958. “Implications of Recent Research on Optimal Storage Rules.” Journal of Farm Economics, 40(2), 290-300. Janzen, Joseph P.; Colin A. Carter; Aaron d. Simth and Michael K. Ajemian. 2014. “Deconstructing Wheat Price Spikes: A Model of Supply and Demand, Financial Speculation, and Commodity Price Comovement, Err-165, U.S. Department of Agriculture, Economic Research Service, April 2014.”. Lagi, Marco; Karla Z. Bertrand and Yaneer Bar-Yam. 2011. “The Food Crises and Political Instability in North Africa and the Middle East. New England Complex Systems Institute. Cambridge, Ma.”. Williams, J. B. 1936. “Speculation and the Carryover.” Quarterly Journal of Economics, 50, 436-55. Wright, B. D. and J. C. Williams. 1982. “The Economic-Role of Commodity Storage.” Economic Journal, 92(367), 596-614. Tags: agriculture, economics, food, price spikes, trade, world | Permalink. *This is the second of three posts related with the potential effects of the current California’s drought. In this one we will talk about consequences on food production, energy and the environment. Take a look at the first post here. Energy is needed to pump, treat, transport, heat, cool and recycle water. According to the California Energy Commission 54 TWh of electricity and 4,284 million therms of natural gas are consumed annually in the entire water cycle. These amounts represent 21 and 32 percent of the state’s total use respectively. Whereas environmental and agricultural sectors account for the vast majority of total water consumption, urban water end-uses are responsible for 58% of total water-related electricity and 98% of total water-related natural gas consumption. Furthermore, urban water supply and treatment, and wastewater treatment accounts for nearly 20% of water-related electricity use. Meanwhile agricultural supply, treatment and end-use account for an additional 22% of all water-related electricity consumption (CEC, 2005). Table 1: California water and water-related energy use per sector (in percentage). As described above, spatial variations in precipitation and water demands across California necessitated the creation of huge water conveyance systems that are now some of the largest single user of electricity in the state. For example, the State Water Project consumed an average of 7.81 GWh of electricity per year between 2005 and 2009 (more than 3% of the state’s total electricity consumption), although during this period, it also generated 4.99 GWh of hydropower per year. Despite the high energy intensity of these conveyance systems more energy is used every year to pump groundwater locally to supply water. Taking all those facts into consideration, and given that urban water use is the principal water-related energy user (Fidar et al., 2010), we might expect that urban demand management policies to reduce residential water consumption per capita during drought through attitudinal changes would result in a decrease in water-related energy use. A significant proportion of residential water savings will come from outdoor reductions, and given that outdoor water is unheated, the reductions in water-related energy will not be as large as might be expected from Table 1. Savings in indoor water use will translate directly to a significant reduction in residential energy use, and as is shown by (Escriva-Bou et al., ongoing research) a 5 percent reduction in indoor water use in a single-family home translates to a 7 percent reduction in water-related energy and a 2 percent reduction in total household energy use. It should also be noted that overall residential energy use would increase during periods of high temperatures because of greater air conditioning use (Scanlon et al., 2013). In the agricultural sector, as surface water becomes limited, an increase in energy use from pumping groundwater on those farms that have the ability to switch their water source must be expected. 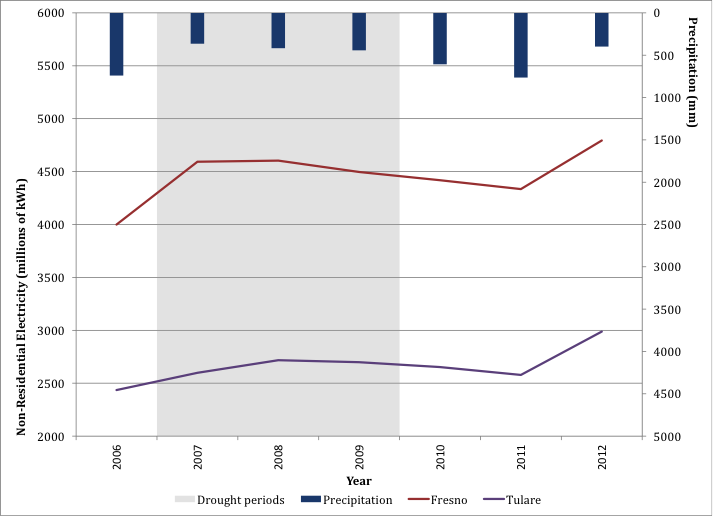 Although only studied during a short range of time, between 2006 and 2012 non-residential electricity consumption for two of the most important agricultural counties in California —Fresno and Tulare— shows that electric consumption is inversely proportional to precipitation (Figure 5). In 2014, this is likely to be exacerbated because the drought is more severe than previous ones. The same trend should be expected if high-value croplands and urban utilities buy water through the market increasing water transfers: again those agricultural users that are able to switch between water sources will sell surface water and energy use will increase due to greater groundwater pumping. Figure 5: Non-residential electricity use in Fresno and Tulare counties. The final consequence that we would to point out is that delta exports to the Central Valley and Southern California will be reduced. Therefore the State Water Project (SWP) and the Central Valley Project (CVP) will reduce their energy consumption. As we mentioned previously, the SWP is the largest single user of electricity, thus a considerable amount of energy will be saved. California produces roughly 70 percent of its electricity from power plants located within the state or plants located outside the state but owned by California utilities, whereas 30 percent is imported from the Pacific Northwest and the American Southwest. On average 54% of within-state electricity production is natural gas-fired, 16% comes from hydropower, 15% from nuclear plants, 6% from geothermal, and the remaining 9% is shared between renewables —wind and solar—, coal, biomass and other sources (CEC, 2014). Most of these energy sources need water in different ways. Whereas hydropower is completely dependent on water availability, it consumes only a negligible part through the reservoir’s evaporation. Thermoelectric power plants, including natural gas and nuclear plants, heat is removed from the cycle with a condenser using cooling water (Torcellini et al., 2003). Even though thermoelectric generation accounts for ~40% of water withdrawals and 3% of freshwater use in the US (Scanlon et al., 2013) and thus competes directly with other freshwater users in California, most generators use saline water and so are thus unaffected by water scarcity. 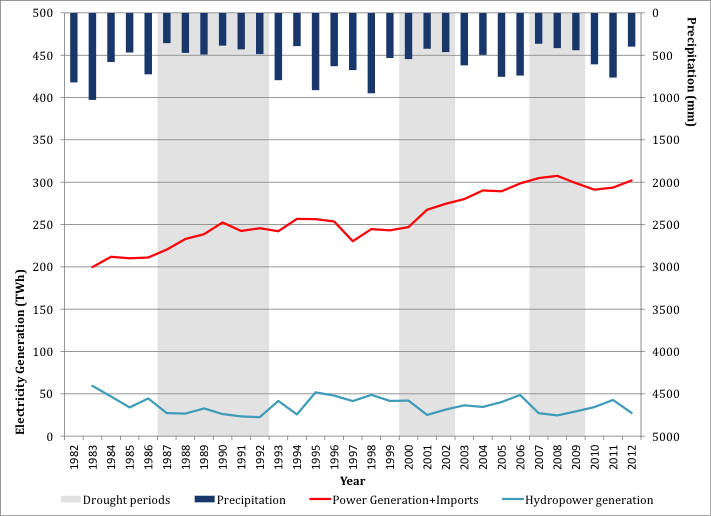 As is shown in Figure 6 hydropower generation has fallen significantly during previous drought events, averaging 28.12 TWh in drought years versus 41.51 TWh/year in non-drought ones during the last three decades. Accounting for differences in comparative costs of electricity generation obtained from Klein (2010), hydropower has a levelized cost of $70.04 /MWh whereas the potential substitute, Advanced Combined Cycle (CC), would cost $114.36 /MWh, thus the average loss amounts to $593 million /year. Another potential concern is if decrease in hydropower generation have a direct effect on electricity prices. As Figure 6 also shows, the relative share of hydropower as a proportion of California’s total energy generation has been decreasing, meaning that any effect on electricity prices will be relatively small because of the reduced dependence on hydropower. Figure 6: Total in-state power generation plus imports (electricity consumption) vs. hydropower generation. Although California’s economic growth is today more reliant on other sectors, its agricultural output remains the highest in the U.S. and this sector, which accounts for 80 percent of total water withdrawals, is highly competitive in the international agricultural market. Nowadays the agricultural sector generates 1.3 percent of the Gross State Product (GSP) and employs 6.7 percent of the state’s private sector labor force (AIC, 2013). These are statewide aggregate data, but if we focus on agricultural regions such as the Central Valley, the share of the gross production and agricultural labor market is much larger for some counties, and more importantly, is usually correlated with poorer regions which are home to more vulnerable inhabitants. Therefore, while the potential impacts on the agricultural sector may not significantly impact the state’s economy as a whole, the effects in these agricultural regions will be intense. i. Water shortages could reduce sources available for crops, meaning that if no alternative water source exists, the producer will have to apply less water, decreasing yields, switch to a less water-consumptive crop which is likely to be less profitable, or reduce the area planted for a year. ii. If the producer has an alternative water source, they will get additional water but with an increase in production costs because of the energy required to pump groundwater or alternatively because water must be purchased through a water transfer scheme. Both situations will lead to a decrease in total profits ceteris paribus. Extrapolating these local implications to a statewide scale, a drought would result in reduced total revenues and agricultural GSP, and the labor market will be damaged, especially in regions dependent on agricultural. Howitt et al. (2011) estimated that $370 million was lost in gross revenue as a result of the 2009 drought, implying 7,500 job losses. 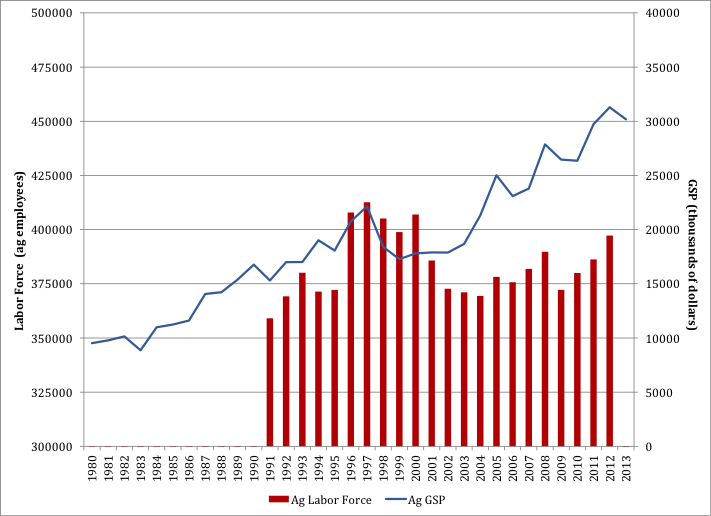 Figure 7: Agricultural labor force and agricultural gross state product. California agriculture is driven by the interactions between technology, resources and market demands (Medellin-Azuara et al., 2011). Technological improvements are reflected by the increasing linear trend of agricultural GSP, whereas the variations above and below this trend are dependent on international market prices —because only a few California crops have market power— and resource availability. For all those reasons, it is very difficult to foresee the effects of the present drought on overall agriculture revenues but it is certain that it will increase production costs as water becomes expensive during times of shortage and more energy is used to pump from the aquifers. Final effects on net revenues will depend largely on prices determined by the international trade. Regarding food prices, there will not be any effect on the internationally traded market goods such as grain, rice or corn because California is a price taker, and in the California-specific crops such as berries or nuts the effects will be uncertain because of the many other variables involved, but ceteris paribus an increase in prices would be expected that reflects the increase of input costs. Direct consequences of water scarcity on the environment are obvious: as a water-stressed region, traditional economic demands will try to get as much water as they can, thus environmental flows will compete with other uses and it is expected that aquatic species will be severely damaged. However, because of California’s unique water system configuration where the Delta plays a main role as a water hub and is susceptible to the effects of salinity (Knowles and Cayan, 2002, 2004) even in driest years it has to remain a minimum runoff in order to maintain salty water far away from water exports sources in the south delta. This economic positive effect of environmental flows will definitely help to prevent rivers running dry, even during drought periods, but there will still be negative effects on aquatic habitats that should be taken into consideration to minimize future species losses. i. An increase in GHG emissions due to the substitution from hydropower to thermoelectric electricity generation is expected, and using an emission factor of 499.1 g CO2e/kWh (Spath and Mann, 2000) it would result in an average 6.68 millions of tons of CO2e per year accounting to the difference between average hydropower generation in normal and drought-period years, that it will have an economic value of $75.75 million given the current price of the GHG allowances. ii. If urban water use decreases following the demand-side management policies that will be implemented, a reduction in urban water-related energy use and greenhouse gases would be expected, that could be significant, considering that that most of the state’s water-related energy consumption is associated with urban uses, especially heating water. Escriva-Bou et al. (ongoing research) have quantified water-heating related CO2 emissions in single-family homes as 9.3 percent of total per capita GHG emissions, thus saving indoor water uses represents a way to significantly reduce GHG. iii. Finally, expected increase in groundwater pumping to substitute surface water shortages will lead to an increase in GHG emissions that should be directly related to the food production sector. The same effect would be expected in urban water utilities which have the ability to shift from surface water to groundwater sources. In the literature reviewed I do not find reliable data to assess this factor, thus it is a field that should be explored. The variation of GHG emissions related with the water cycle is at least very symbolic since water systems in arid and semi-arid regions are increasing their vulnerability with global warming (Hartmann et al., 2013). AIC (2013) The measure of California agriculture. Highlights. University of California, Davis. Agricultural Issues Center. Available at http://aic.ucdavis.edu/publications/moca/MOCAbrochure2013.pdf. Accessed 21/4/2014. CEC (2005) California’s Water – Energy Relationship. Prepared in Support of the 2005 Integrated Energy Policy Report Proceeding. California Energy Commission. November 2005. CEC-700-2005-011-SF. CEC (2014) Energy Almanac. The California Energy Commission. Available at http://energyalmanac.ca.gov/electricity/. Accessed 21/4/2014. Escriva-Bou A, Lund J, Pulido-Velazquez M (ongoing research) Modeling residential water, energy, carbon footprint and costs in California. University of California Davis. Fidar A, Memon FA, Butler D (2010) Environmental implications of water efficient microcomponents in residential buildings. Sci Total Environ 408:5828-5835. Hartmann DL, Klein Tank AMG, Rusticucci M, Alexander LV, Brönnimann S, Charabi Y, Dentener FJ, Dlugokencky EJ, Easterling DR, Kaplan A, Soden BJ, Thorne PW, Wild M, Zhai PM (2013) 2013: Observations: Atmosphere and Surface. In: Climate Change 2013: The Physical Science Basis. Contribution of Working Group I to the Fifth Assessment Report of the Intergovernmental Panel on Climate Change [Stocker, T.F., D. Qin, G.-K. Plattner, M. Tignor, S.K. Allen, J. Boschung, A. Nauels, Y. Xia, V. Bex and P.M. Midgley (eds.)]. Cambridge University Press, Cambridge, United Kingdom and New York, NY, USA. Howitt RE, MacEwan DJ, Medellin-Azuara J (2011) “Droughts, Jobs and Controversy: Revisiting 2009.” Agricultural and Resources Economics Update 15(6): 1-4. Klein J (2010) Comparative costs of California central station electricity generation. California Energy Commission. Final Staff Report. January 2010. Knowles N, Cayan DR (2002) Potential effects of global warming on the Sacramento/San Joaquin watershed and the San Francisco estuary. Geophys Res Lett 29. Knowles N, Cayan DR (2004) Elevational dependence of projected hydrologic changes in the San Francisco Estuary and watershed. Climatic Change 62:319-336. Medellin-Azuara J, Howitt RE, MacEwan DJ, Lund JR (2011) Economic impacts of climate-related changes to California agriculture. Climatic Change 109:387-405. Scanlon BR, Duncan I, Reedy RC (2013) Drought and the water-energy nexus in Texas. Environ Res Lett 8. Spath PL, Mann MK (2000) Life cycle assessment of a natural gas combined-cycle power generation system. National Renewable Energy Laboratory. U.S. Department of Energy. Torcellini P, Long N, Judkoff R (2003) Consumptive water use for U.S. power production. National Renewable Energy Laboratory. U.S. Deparment of Energy. December 2003. Tags: agriculture, California, Drought, economics, energy, food, water management | Permalink.